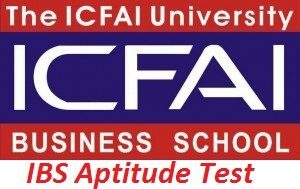 IBS Aptitude Test 2017: The IBS Aptitude test is conducted by the ICFAI Foundation for Higher Education (IFHE) for admission in the MBA programme of IBS. The examination is conducting for the postgraduate applicant on the National Level. Only can eligible applicant can fill the online application form for IBSAT 2017 by following the official portal. A candidate who wish to get the information about the IBS Aptitude Test 2017 like eligibility criteria, Important Date, Admit Card/ Hall Ticket and so many another process which is applicant need while aptitude test that all the information applicant will get here. They just have to scroll down their mouse to know. All the candidate have to meet their eligibility criteria before applying for the IBS Aptitude Test 2017. Following are the Eligibility Criteria of IBSAT 2017 which is given below. Applicant has to complete their graduation from the recognised university with minimum 50% of marks. The student should have to complete their 10+5 from recognised education board/ University. An applicant who do not from able to fulfil the eligibility criteria of English medium graduation they have to submit their TOEFL/ NELT/ IELTS scores. Any candidate who has to valid score card of the CAT they are also eligible for the INSAT 2017. A student who is given their final year examination even they are also eligible. Here are the IBSAT 2017 Important Dates which are given down as follow interstate applicant can refer these dates are given as follows. All the about given dates are not confirmed we will update the important after the official notification we update the Important dates. The candidates have to fill the IBSAT 2017 Application Form before last date o filling the application form. The applicant will able to fill the application form on the official site. Now here is the process of filling the application form showing down. Firstly applicant has to click on the official website. Then register their email and phone to received the User id and password. Log in with the help of the user id and password opening click on the application form. Click on the submit button and also take a print out copy for the other uses. Following are the list of the IBSAT 2017 Participating Institute which as follows applicant can refer this. Admit card applicant who fills the application form only they will get the IBSAT 2017 Admit Card which is available on the official website after the announcement. In the admit card applicant will get the information about the examination center. Candidate will have to carry their admit card in the examination center without the admit card applicant will not allow entering in the center. IBSAT 2017 Hall Ticket applicant able to download the admit card before the examination. Applicant must read all the given instruction which is given in the admit card. Along with the hall ticket applicant has to carry one photo identity card in the examination. And follow the instruction while given the entrance exam. The entrance examination test is conducted by the ICFAI Foundation for Higher Education (IFHE) for the admission for the MBA programmers. Those candidates who have appeared in the IBS Aptitude Test 2017, they will get the Exam Result of IBSAT 2017 on the official website. On the basis of the result, applicant will get to know whether they are selected for the selection process or not. IBSAT 2017 Selection Process candidate who able to qualified the UBS Aptitude Test 2017 than they will select for the selection process. To clear the selection process that candidate will be called at IBS Hyderabad for the selection process. The applicant will select on the basis on performance in Group Discussion, Personal Interview, and the past academic performance. After the declaration of the examination result, the ICFAI Foundation for Higher Education (IFHE) will publish the Cut Off of IBSAT Exam 2017 individual. An applicant who is named on the cut off the list then they will select for the selection process. This examination is on Online Mode examination which is conducting every year for the admission of MBA programme of IBS (ICFAI Business School) Hyderabad. The Applicant seeker to admission to MBA programme they all are has to give IBSAT 2017 by the eligible applicant. This examination is on Computer based examination which is conducting in 12 days log window every year. A student who wants to know about the IBSAT (IBS Aptitude Test) they just have to click on IBSAT 2017 link here applicant will get the information.